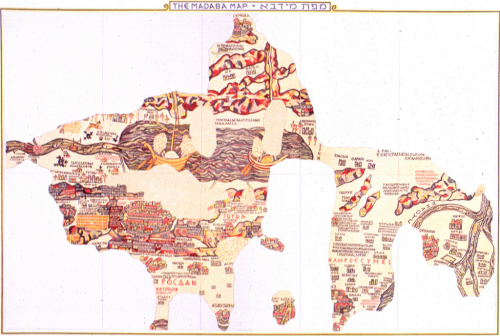 Art comes in many forms and many artists use maps as a vehicle for expression. 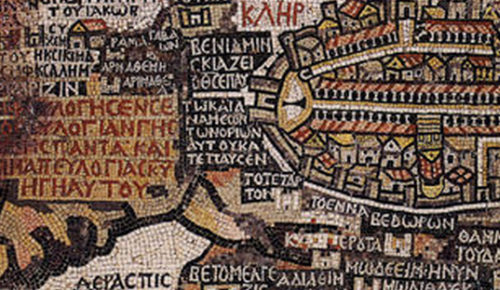 The most impressive surviving example of Byzantine map-making is also the worlds oldest floor map. That is, a map on a floor made of mosaic tiles. 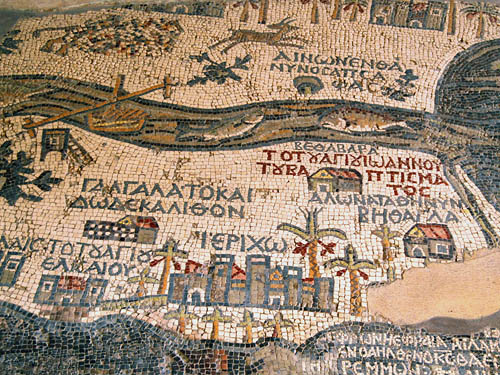 It lies on the floor of St. George’s Church at Madaba in Jordan. Not all of the map survives as the image shows but the remaining segments clearly show the Holy Land with north upwards and Jerusalem in the centre. Topography and place names are present. 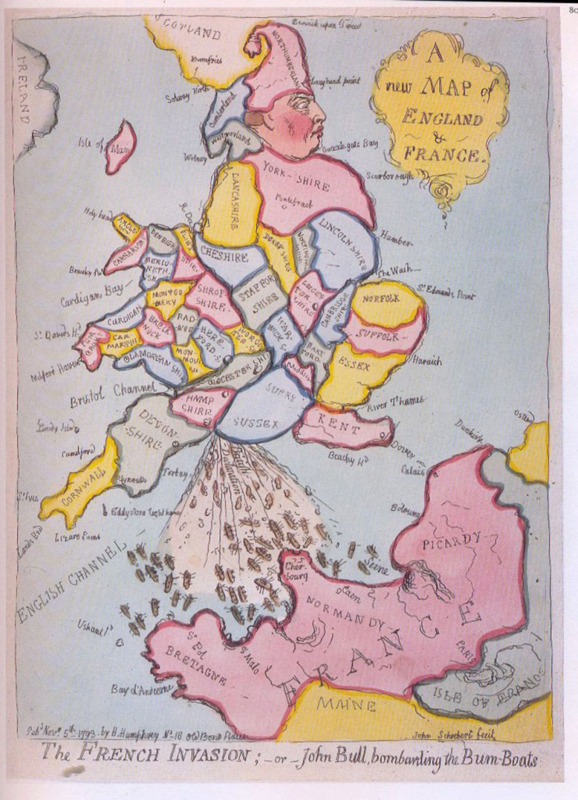 Scale changes across the map which is an early example of exaggeration (as a process of generalization) to show areas of more importance as relatively larger. They required more space for the greater levels of detail. The map depicts scenes from the Bible as well as everyday life but the main intent of the map was to encourage religious pilgrimage. The detail and the intricacy of the map shows craftmanship of the highest order, both in designing such a work made entirely of mosaic tiles but also in its construction. The map was created with the laying and setting of tesserae, small square shaped tiles of marble, limestone and coloured glass. The original map would have been sketched out then craftsmen would have laid the tiles. This is almost paint by numbers but the combination of the original designer and the craftsmen able to execute delivery of the map shows how maps are made through collaboration of people with very specific skills. A beautiful and artistic mosaic tile floor…which happens to be a beautiful map too. Organized by the ICA Commissions on Map Design and Neocartography, this one-day workshop pre-conference to the ICA International Cartographic Conference 2013 will explore practical themes relating to the design and creation of effective online maps and information products. The updated schedule is now available below and we very much look forward to your participation in Dresden this coming Saturday (24th August 2013). We aim to start at 9:30 and we are providing full morning and afternoon refreshments as well as lunch. There is no cost to attend the workshop. The panel will be invited to discuss a range of themes that have emerged throughout the day and also topics that the participants wish to explore. In particular, we’re keen to explore how a research agenda for design in online mapping might be shaped for the next few years. What are the major challenges and opportunities? How might these be approached and, possibly, solved? What can the ICA Commissions do to push forward research and/or action? At this year’s annual fall NACIS meeting, a special series of events were planned around the subject of the aesthetics of mapping. The goal was to bring together members of the NACIS community and invited participants from outside the cartographic community to encourage cross-disciplinary communication around the central subject of the aesthetics of mapping. The events included a forum that convened during the first two sessions on the first day of the conference (Thursday, October 18). In the first session, forum leaders introduced the subject and laid out the agenda. Dr. George McCleary, from the Department of Geography at the University of Kansas, then presented a keynote address titled “Beyond Map Layout and Design…Aesthetics?”, in which he traced the development of studies in aesthetics in art, cartography, and related fields. His research has lead George to consider aesthetics as “unity in design”, with the result that the map “looks right” and the map “works”. Presentations were then delivered from presenters with three different perspectives from outside the field of cartography. Johannes Moenius, a professor in the School of Business at the University of Redlands in California, presented his work in Spatial Economic Analysis with special emphasis on his application of GIS and visualization to the effects of technical standards on trade flows and the dynamics of comparative advantage. Elijah Meeks, the digital humanities specialist at Stanford University, discussed projects that he has worked on that give Stanford faculty access to project design, visualization, and software development oriented toward the creation of digital scholarly media. He demonstrated a number of projects including the Republic of Letters and Orbis, a geospatial network model of the ancient Roman world. Lillian Larsen from the Department of Religious Studies at the University of Redlands, and Steve Benzek of the US Army Geospatial Center, then presented jointly on a project to map the travels of Paul the apostle. Stuart Allan, of Allan Cartography and Benchmark Atlases, and Nathaniel Kelso of Stamen Design, were then requested to offer commentary on the presentations. Subsequently, the floor was opened for discussion which was quite lively given the large number of attendees and the interesting topics that had been presented. After a short break, the forum continued with presentations from two long-time NACIS attendees, Daniel Strebe and Mark Denil. Mark kicked off the second session with a presentation titled “Style and Taste” in which he defined style as a collection of appropriate choices of graphic elements which can therefore can be “parameterized”, whereas taste requires selection and arrangement of the style choices. Dan followed with a presentation titled “The Impotence of Maps, or Deconstructing the Deconstruction of their Construction” in which he offered a number of somewhat controversial views, including the decreasing importance of maps and the suggestion that not all maps should be made for all people. These presentations set the stage for an extended discussion with the audience and the forum participants. Stuart Allan and Nathaniel joined all the morning’s presenters at the front of the room so that audience members could ask questions of the forum participants and offer their comments. Topics that came out of that discussion included the following. What does “aesthetics” mean? Does it matter if we do not specifically define the term? This conversation was spurred by many comments from audience members and forum participants, but especially George’s keynote presentation on the historical development of thinking about aesthetics in various disciplines, as well as Leland Wilkinson’s definition of aesthetics as “perception. Is aesthetics akin to informational fidelity, a conversation that was sparked by Lillian’s opinion that the “beautiful map” was the one that most accurately depicted the nature of the data and was therefore graphically elucidating. For these types of maps, what you are showing is in sync with the data. How role does graphical fidelity play? This conversation was triggered by Gordon Kennedy’s comment about making maps that look historical by using techniques that were used at the time. He suggested that how you are showing something has to be in sync with what you are showing. There was quite a bit of discussion relating to the “scratchy map” (the map of the journeys of Paul the apostle by Steve and Lillian). A central topic was using mapping techniques that automatically allow the reader to perceive the true nature of the data, which are especially useful for “uncertain” or “incomplete” data. There was also a discussion of the concept of an “aesthetics sliders”, which some people found disturbing. The topic of clarity as a requirement for aesthetic design was also raised. Dave Imus remarked that in his experience, clarity often leads to people finding a map aesthetically pleasing. Sven Furhmann questioned whether “clarity is for map readers who don’t have time” and “aesthetics are for people who do have time”. Also discussed was the subject of aesthetics in situations where you give the control to the map reader. This conversation was spurred by Elijah’s presentation on mapping complex data in a compelling and understandable manner using an interface that allows readers to control the display. This raised the issue of the effects of multiple perspectives and modular approaches on the aesthetics of the maps. People also discussed the need to get peoples’ attention (or “the business case for aesthetics”), which was theme that was introduced in Johannes’ presentation on aesthetics for maps of economic variables. The subject of map critique was also raised when Martin Gamache asked about teaching critique methods in schools. Cindy Brewer responded that the goal of teaching critique is to shape students’ understanding of what a good map is rather than ask their opinion about good map design. Daniel Strebe’s presentation on “the Impotence of Maps” sparked a lively discussion about the utility of maps. He also questioned the authority of maps and whether we should/can slough off some audiences for some maps. These topics were revisited to some extent the following day when interested participants met at Stanford’s Restaurant to discuss the presentation for the closing session of the NACIS conference in which Aileen would recap the events and share a summary with attendees at the annual NACIS banquet. It was clear that the subject of aesthetics and mapping is of continuing interest to many in the NACIS community as well as outside of the cartographic mainstream. As a result, there are plans to compile a special issue of Cartographic Perspectives, the online NACIS journal, around this theme. There was also a suggestion that this theme be addressed again at next year’s NACIS conference, albeit in perhaps a different format. There was general consensus that one of the most productive and useful outcomes of the events that centered on the theme of the aesthetics of mapping was the opportunity to bring together members of the NACIS community and participants from outside the cartographic community to discuss a theme of shared interest. Report by Aileen Buckley, Professional Cartographer, Esri Inc. The North American Cartographic Information Society (NACIS) held its annual meeting in Portland, Oregon (17-19th Oct). The conference hosted a forum on Aesthetics and Mapping, which was co-sponsored by the ICA Map Design Commission. The Aesthetics of Mapping forum was a cross-disciplinary discussion led by participants with various backgrounds in cartography, economics, and the humanities. Forum leader Aileen Buckley (ESRI) began with an overview of her four key guidelines and rationales for aesthetics in cartography: iconography, design principles, tools and techniques, and the idea of maps as both destinations and portals. Daniel Strebe (Mapthematics) addressed the utility of maps in the modern world and made the claim that maps have moved from the center to the periphery of source information and presentation medium. The information maps supply is available elsewhere in more accurate forms; maps have maintained their rhetorical power, but have lost their authoritative power. It is always important for cartographers to keep their audience in mind when mapping, but they need to abandon their quest for expanding their audience through obsessive simplifying and minimalizing and keep more of what’s important to the people who will use their maps. The North American Cartographic Information Society (NACIS) is holding its annual meeting in Portland, Oregon next week (17-19th Oct). The annual carto-fest will cover a range of themes including a special series of sessions on the aesthetics of mapping co-sponsored by the ICA Map Design Commission. The idea behind the sessions is to bring together a wide range of academic, practicing, commercial and entrepreneurial cartographers to discuss the definition, role, value and purpose of ‘aesthetics’ in modern cartography. There is no agenda other than to bring light on the often thorny subject of the importance of beauty and the aesthetic in mapping. If you’re going to NACIS, or indeed are taking part then please do join in what promises to be a fascinating discussion. Commission co-chair Bernhard Jenny is attending the conference and we’ll report the key findings here after the conference.